NMM 10773. Spinet by Charles Haward, London, 1689. Single manual, GG/BB-c3 with divided E-flat (4+ octaves). Tony and Bonnie Vinatieri Family Trust, 2004. "The Diary of Samuel Pepys and the NMM's Spinet by Charles Haward, London, 1689"
From National Music Museum Newsletter 31, No. 4 (November 2004), pp. 4-5. On April 4, 1668, Samuel Pepys, the English bureaucrat remembered now for his diary, made a detour on his way to White Hall: took Aldgate Street in my way, and there called upon one Hayward that makes virginalls, and did there like of a little espinette (spinet) and will have him finish it for me, for I had a mind to a small harpsichon, but this takes up less room, and will do my business as to finding out chords, and I am well pleased that I have found it. Pepys referred to the spinet in fashionable French (espinette). Hayward is Charles Haward, a leading London harpsichord maker from 1660 to the late 1680s. 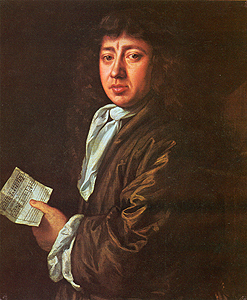 On July 15, 1668, several months after Pepys' initial visit to Haward's shop, the instrument was delivered to his house. 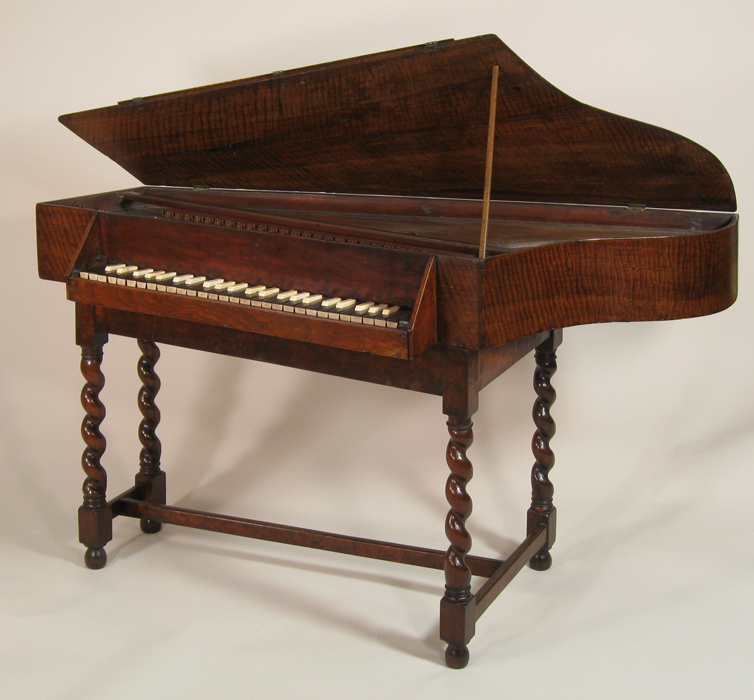 Now, some 336 years later, a spinet by the same maker has been delivered to the National Music Museum. Inscribed Carolus Haward Fecit 1689, it is his latest known instrument. While close to 150 18th-century English spinets have survived, 17th-century examples are much more rare. The NMM is fortunate indeed to have acquired one of only 20 some 17th-century English spinets known to survive. It is the second notable spinet to enter the NMM's collections, the first being the magnificent instrument by Johann Heinrich Silbermann, Strasbourg, 1785, on display in the Pressler Gallery. Spinets are a small form of harpsichord with the long side and strings set at an acute, not a right, angle with the keyboard side. While harpsichords usually have two or three sets of strings, spinets have only one, and the bass strings are shorter. Until the 1660s, the virginal, a rectangular form of the harpsichord, was the most popular small keyboard instrument in England. The spinet, which occupies less space than the typical English virginal, is thought to have been invented by Girolamo Zenti, an Italian maker who worked in England for a year or two in the early 1660s. By the late 1670s, it had replaced the virginal as the principal keyboard instrument in English homes, a position that it retained for about a century, until supplanted, in turn, by the square piano. 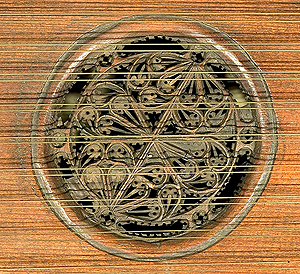 The soundboard is graced by a Gothic-style rose delicately cut from layers of wood and parchment. During this time, there was a comparatively large, prosperous middle class in England, and the number of spinets made to satisfy this clientele was in the thousands. 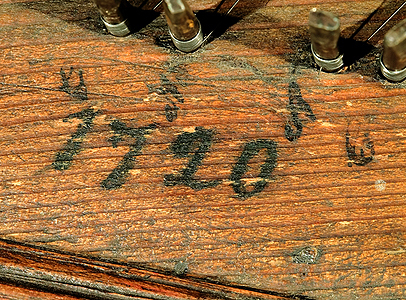 The serial numbers of the most prolific 18th-century spinet makers, Thomas Hitchcock and his son John, active from about 1700 to 1774, go up at least to 2018, indicating a rate of production as high as 35 instruments a year. During the 18th century, English harpsichord making was dominated by two London firms, Burkat Shudi and Jacob Kirckman. (The NMM's splendid harpsichord made in 1798 by the latter's successor, Joseph Kirckman, is on display in the Pressler Gallery.) The noted harpsichord historian, Frank Hubbard, observed some years ago that “Kirckman and Shudi concentrated on harpsichords, apparently leaving the crumbs to the competition;” i.e., to such minor makers as the Hitchcocks, whose production consisted almost entirely of spinets. The situation was rather different in the 17th century, when the leading London makers built both harpsichords and spinets (or, earlier, virginals). The only surviving English harpsichord from the second half of the 17th century was made by Charles Haward in 1683. Further, these earlier makers did not mass-produce their instruments like Hitchcock, Kirckman, and Shudi did. Rather, Charles Haward and his colleagues seem to have made them one at a time or, at most, in very small batches. This is shown by the six surviving Haward spinets for which detailed information is available — the basic concept is the same, but no two are exactly alike. 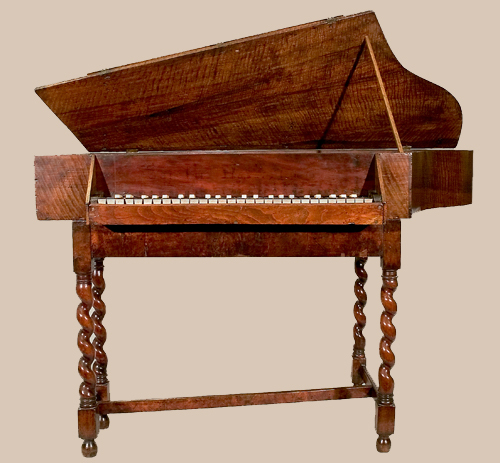 The most notable characteristic of Haward's style, evident in the NMM's 1689 spinet, is the S-shaped bent side. This feature (shown above), seen in all of Haward's instruments, including his 1683 harpsichord and a few instruments by other English makers, gradually passed out of use in England in the early 18th century. Another early feature is the keyboard with ebony naturals and ivory accidentals, the reverse of the modern pattern found in most 18th-century English instruments. Although 16th- and early-17th-century English keyboards were most often made with light-colored naturals and dark accidentals, the makers of Haward's generation followed the latest French style, seen, for example, in the NMM's harpsichord by Nicolas Dufour, Paris, 1683. However, while the accidentals of 17th-century French instruments were made of bone, Haward made his of ivory, one of the precious commodities imported from South Asia by the British East India Company. 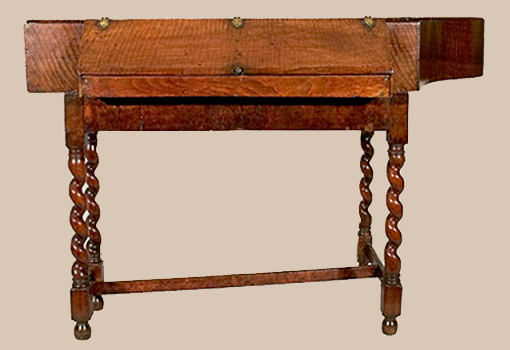 Early English keyboard instruments typically are handsome pieces of furniture. The 1689 Haward is no exception, and the curly figure of its walnut case is especially attractive. The interior is veneered in red cedar (imported from the British colony of Bermuda or Virginia). The instrument rests on a stand, certainly old and perhaps of the period, in appropriate 17th-century style with twist-turned legs. The compass of the spinet is an apparent BB to c3, but in a common short-octave arrangement the BB key was tuned to GG, C-sharp to AA, and E-flat to BB (or BB-flat). The missing accidentals in the bass, especially GG-sharp and C-sharp, were not often needed in the music of the period, but makers offered the option of dividing one or two of the lowest accidental keys to provide some of the missing notes. In this case, Haward divided the E-flat key: the front half plays BB (or BB-flat), the back half E-flat. Click here, or on the lowest E-flat on the keyboard, for a closer view of the divided E-flat key. The spinets of Haward and his contemporaries are all rather small, with short strings intended to be tuned to the prevailing English quire pitch, about one and a half semitones above modern pitch. It is a common misunderstanding that pitch gradually rose over the course of the centuries. There were many historical pitch levels, high and low. Several other 17th-century instruments in the NMM's collections were also designed for high pitches: the North German chest organ by Jacob Hannss on display in the Abell Gallery; the harpsichord by Gommaar Van Everbroeck, Antwerp, 1659; and, the small violin by Hieronymous Amati, Cremona, 1609, on display in the Witten-Rawlins Gallery. The most prominent English composer in Haward's time was Henry Purcell (1659-1695). 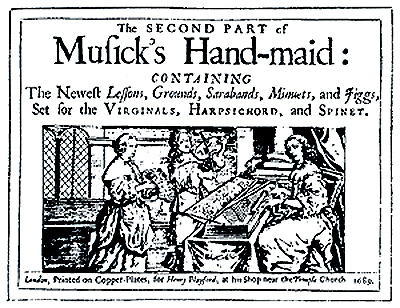 Interestingly, in 1689, the year that the NMM's spinet was made, The Second Part of Musick's Hand-maid, edited by Purcell, was published in London. In his introduction, Purcell described this collection of keyboard pieces by himself, John Blow, and others, as "useful not only for Beginners, but the more Skilful in the Art." This easy to moderately difficult music is the sort of repertoire that would have been played by the proud amateur owners of Haward spinets. That the NMM's spinet was played by a beginner is suggested by letters written along the lower edge of the nameboard to indicate the notes played by the adjacent keys. Continued use of the instrument for many years by a series of beginners (perhaps the daughters and granddaughters of the original buyer) is suggested by a second row of letters, written probably when the first set faded. The instrument undoubtedly remained in use well into the 18th century. It probably underwent some repairs, when the date 1720 was written in front of the wrest pins. Very well restored again about 25 years ago, it remains in excellent playing condition. While the tone of a spinet cannot possess the grandeur of a large harpsichord, the NMM's Haward spinet, built more than 300 years ago, has a voice nicely suited to the music of Purcell and his contemporaries.